Orgone means life energy (Chi, Prana or Ether.) It’s a mixture of crystals, resin and metal. It cleanses and balances energy and harmonizes the Chi in and around us. Additionally, orgone transforms negative energies into positive energy and is effective against negative earth rays, spin inversion and electrosmog. 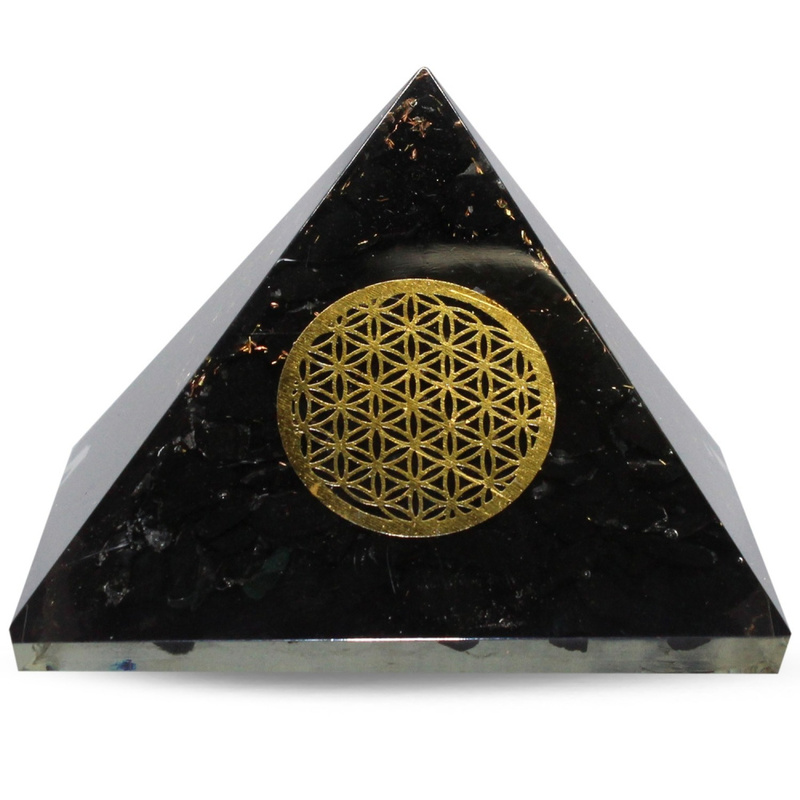 The orgone pyramid is specially made to balance energy fields in your living or working space. The pyramid can also be put in the pocket of your pants or under a pillow. In order to activate the orgone pyramid to your aura, hold it in your hands for at least 20 seconds. The shape of the pyramid with its corners and points makes it ideal for attracting and removing energy. This pyramid is provided with the Flower of life – symbol. The sacred geometry of the Flower of Life: a symbol that can be found in different esoteric movements. It’s a powerful spiritual symbol full of mathematics. With her 19 circles she is currently known for her use within the New Age movement. She represents the unity-consciousness. This functional decoration piece has a size of 40 mm. Shungiet also helps with many disorders affecting digestion and skin (eczema, allergy). She takes away tension, which makes her very popular among people with sleep problems and headaches. Orgonite users believe that energy is transformable. This perspective gives us the chance to purify our environment from negative stimuli by transforming this energy into a salutary power. Orgonite works constantly without the need to unload and charge the stone. You can place these pyramids next to devices that emit harmful radiation to balance the etheric energy. Many people benefit from the orgone energy fighting insomnia and nightmares by placing the orgonite next to or above the bed. The energy is attracted because of the organic material of the stone (casting resin) and then it’s reflected by the inorganic materials (metal). The conversion into a pure, positive flow is caused by this repetitive process in which the energy is reordered.